Although there are very few species of animals that are not heading towards extinction, we do have organizations heading towards implementing major projects to save these species from being extinct. Though very little can be done towards the naturally decreasing species, some organizations have made great efforts and have shown success in their mission. This is one organization I want to talk about as it has made a place in my heart. One such organization is called Snake Cell. It is an organization driven by one man, who has dedicated his life to help people, and snakes at the same time. Located in Chandigarh, India, Captain Suresh runs this organization without any funding from the government. The goal of Snake Cell is to educate people on how to save yourself from fatal snake bites and how to "AVOID KILLING" a snake as that is the first reflex of people. 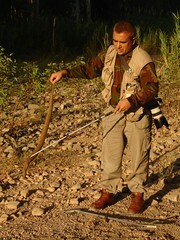 Chandigarh has 3 deadly species of snakes namely Cobra, Russell's Viper and Common Krait. Each of these species are very venomous and can easily kill a human within a few hours. Fortunately the Indian Government has agreed to provide Captain Suresh's phone number to people when they call and complain about a snake in their house. When people call him, he rushes to the house and safely captures the snake, lectures the residents on what to do when they see a snake next time, and how to avoid being bitten, and also what to do if you do get bitten by a snake. He then takes the snake to his house, examines it, makes sure if the snake has been well fed, not sick or injured and then releases the snakes in the wild. If the snakes need some rehabilitation, he takes care of them and releases them when he is convinced that the snakes are alright. He deals with venomous snakes without being paid for his work. But he religiously works day and night and has rescued more than 1000 snakes till now. He often conducts corporate sessions on how to handle snakes and how to avoid getting bitten and educates as many people as he could. You see him in the newspapers often with his messages on how to co-exist with these misunderstood reptiles. I have spent quite a lot of time with him and his snakes and he just drew the fear of snakes out of my heart for good. I understand snakes now and I know that if given a chance to bite or escape, the snake would prefer escaping because they, like other animals, like to preserve their resources like energy, venom, etc for feeding themselves rather than attacking humans and other animals that they can not eat. To help support his efforts, I have offered him that I can setup a donation option for him so people like me, who do understand his efforts can help by contributing all that we could. To this Captain Suresh has agreed and you can now make a donation to support his efforts. Use the buttons below to make a donation to Snake Cell. Please note: Your entire donation will be directly sent to Snake Cell. I am offering this option as my contribution to support Snake Cell. I am not an affiliate / reseller or in any way associated with Snake Cell, other than being an admirer and supporter. Your donations are highly appreciated. If you would like to read more about co-existing with snakes, I highly recommend that you visit his website and enjoy the hundreds of magnificent photographs that he has taken as well as information that can help you live a life without the fear of snakes.